With the 2018 Derwent Art Prize now open for entries, we spoke to 2016 exhibitor and prize-winner Tim Wright about how drawing informs his wider practice and what advice he has for artists entering this year’s competition. Tim, your drawing Helen Schone 14 won Third Prize in the 2016 edition of the Derwent Art Prize – tell us about the piece and why you chose to enter it in the Derwent Art Prize. I wanted to get two aspects of the subject’s character into the composition so that the she has a kind of alter ego, forming a double portrait. One of the images is pulled back rather, almost as if she’s observing herself in the drawing – she is self-aware and you can see the other character as a pendant to the more close-up study. What role does drawing play within your creative practice? Drawing informs my wider practice – it’s a very important part of how I develop ideas about pictures. The immediacy of drawing allows me to work quickly and experiment : you can make a drawing and stick it onto a painting, move it around, tear it in half or collage it; and you can generate a number of compositions in a very short period of time. What motivated you to enter the Derwent Art Prize? I entered the Derwent Art Prize as it’s specifically a drawing competition – something I’m particularly intrigued by and interested in. There was no painting involved and with that, the project celebrates only drawing, giving it a platform and show the power and importance of drawing – showcasing pencil drawing as artworks in their own right. 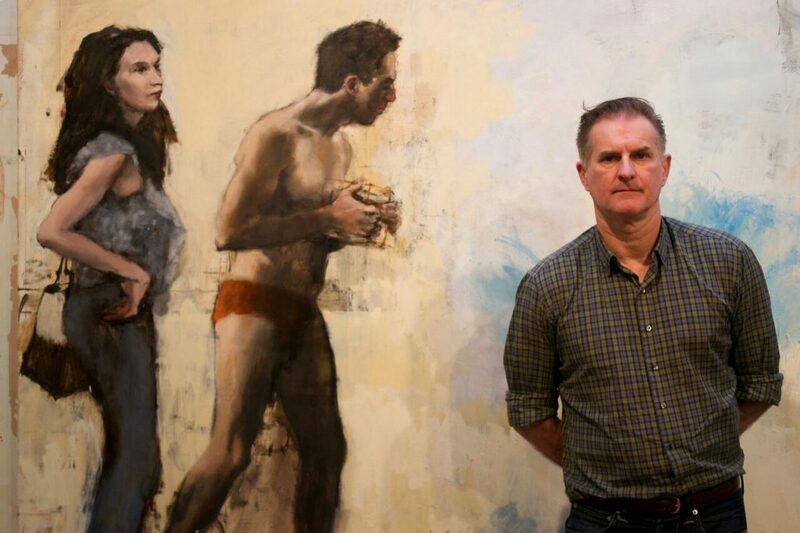 Was the international reach of the Derwent Art Prize an important factor for you? For me, the international reach of the competition is key because the art world is international. It’s really important to measure yourself internationally and see how artists from around the world are approaching drawing – what comes out of and inspires other cultures is often quite surprising. What media do you tend to use when making drawings? In my more recent drawings, I’ve been using red chalk and watercolour. Watercolour allows you to be very expressive and brings pace and gesture to the surface, articulating the drawn forms in a very quick and direct way. The red chalk emphasises the form and introduces a textural quality – for me, the works sit halfway between drawing and painting. You’ve spoken before about how the figure can serve as a means if exploring wider themes – what subjects are you touching on in your current work? I’ve been looking at figures in isolation quite a lot and also have been thinking about how we think about ourselves and how we present ourselves to the world. I’ve started bringing other figures into play so there’s an interaction on the canvas. I’m interested in a figure that is self-aware, self-contained but with a certain disinterestedness about it – a preoccupied figure – in it’s own world, perhaps as we all are day to day. As part of the Derwent Art Prize 2016, you ran a life drawing class at the Mall Galleries. Do you find teaching helps your own practice? For example, do you ever learn new techniques and approaches from students? It’s quite interesting because if I’m teaching life drawing, I’ll often ask students to do drawing exercises which I don’t utilise in my own practice – mostly because I have my own drawing habits. However, I often see exciting results in these classes, particularly when students are doing very quick studies using a continuous line, without thinking or analysing. It reminds me that there are so many approaches to drawing– so yes, there is a sort of visual feedback when teaching. What advice do you have for artists entering this year’s Derwent Art Prize? If you’re entering this year, don’t try and second-guess what the judges want to see. I don’t think that ever really works. You have to really be yourself and don’t tame or compromise the work. Make a statement and don’t be inhibited in the drawing you produce. And what are you working on at the minute? Have you got any exhibitions coming up? I’m working on some large scale paintings and works on paper for a show at Pontone Gallery. The works are loosely based around the idea of shipwreck, people in hazardous but imagined situations – locked in a world of paint. There are references to landscape and seascape in the paintings and drawings, but also some allusions to Turner’s painterly approach.